Quick post to show you some little 2 1/2 inch hearts I made for my friend's wedding cake! This heart is made from the pattern Granny Heart Bunting by Sandra Paul, and you can find the Ravelry page here, and the pattern on her blog here. 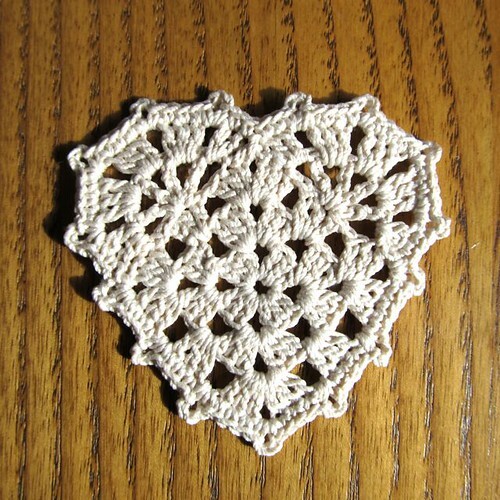 This one is made from the pattern Floral Heart Motif from Annie's Attic. The Ravelry page is here, and the direct link to the pattern is here. 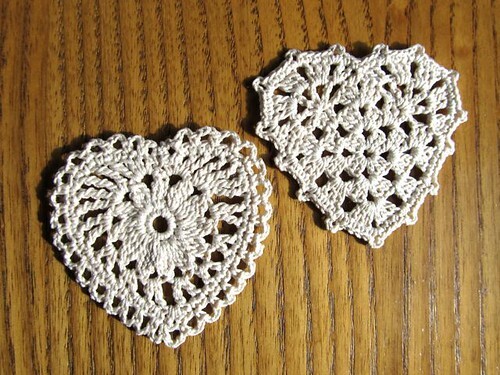 For both of the hearts I used Aunt Lydia's size 10 in the color natural, and a 1.5 mm steel crochet hook. I starched them with a corn starch recipe I found on Maggie's Crochet. Now they will be put on little sticks, and will top her wedding cake! They will look amazing on a wedding cake! Hello Kate! 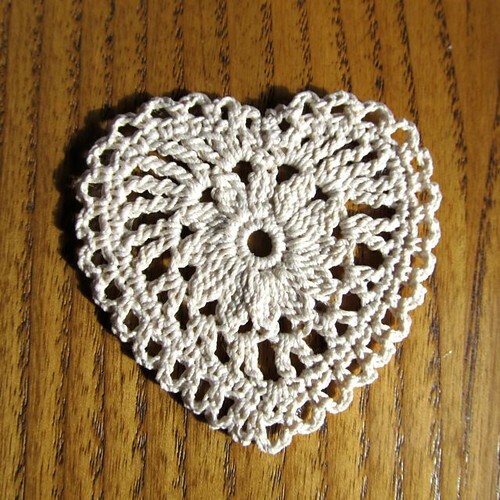 I love the granny heart (I think I like granny anything), but that second heart with the flower in the centre is just lovely and I'm going to try it out! Thank you for including the corn starch stiffening link. I will be trying that out as it's so difficult to find liquid starch these days. I shall look forward to seeing your friend's wedding cake with those lovely hearts decorating it! So pretty! Those hearts are just perfect for the top of a wedding cake. I Won Some Paintings From Genuine Mudpie!